This web ad from Japan for the Tosando Music School is the latest viral tearjerker. In testimony to its crafting, you won’t need to understand Japanese to follow it or to be touched by it. At a time when brands are building increasingly complex digital communications programs, and are turning to oblique forms of branded entertainment to get noticed, it is heartening to see a piece of communication that relies on neither technology or gimmickry. The only thing digital about this is, of course, the channel. Being online allows for a three and a half minute spot compared to Japan’s typical 15 second television commercial length. This aside, its power comes from classic advertising traditions and techniques. Here it is without further explanation. If after watching it you need clarification, a few plot notes follow. And then, for those interested, there are several observations about the advertising heritage it draws from. The pianist is the bride’s father who surprises both bride and groom by playing at their wedding as neither knows he can play the piano. He is introduced by the master of ceremonies as having a message for the couple. At first the daughter wants her father to stop as she feels both embarrassed and resentful. Through the flashback sequences we are shown that the resentment is due to their strained relationship following the death of her mother. But the flashbacks also show that the melody he is trying to play is one her mother used to play. As she comes to realise that this is her father’s attempt to do something special for her on her big day, the emotions evoked by her memories warm her to him and to his performance. The spot ends with the tagline “Music transcends words”. What makes this spot so compelling? Here are a few thoughts. Much has been said about why brands should tell stories. The underlying rationale for this is that humans are ‘wired’ to receive stories. As argued by Jonathon Gottschall in The Storytelling Animal, we use stories to help us navigate life’s complex social problems and to make sense of the world. Or as stated by IBM executive and ‘social business evangelist’, Sandy Carter, “Tell me a fact and I’ll learn. Tell me a truth and I’ll believe. But tell me a story and it will live in my heart forever”. The Tosando spot uses well established storytelling principles to engage the viewer. These include the sub-plots of the flashbacks and the secret piano lessons, the twist in the bride’s father playing her mother’s favourite piece of music, and the moment of conflict resolution when the bride reconnects with her father. It has been observed that music is emotion in sound. The right piece of music can entirely carry an ad or amplify its impact. Tosando’s choice of music is clever. The piece – Pachelbel’s Canon in D – is a perennial favourite at weddings, and so has personal meaning to many people. While it is widely known and loved, most would only have heard it a few times, so it is not overexposed. Plus it is usually played by a string quartet, so hearing it played on piano makes the familiar unfamiliar, which serves to further heighten our attention. Having lauded the music, what if the spot had no sound at all? Would it still work? To a degree it probably would. The fact that you can follow the storyline without understanding what is being said, shows that its creators recognise that film is primarily a visual medium. An often neglected test for the efficiency of a television ad concept is whether it can communicate without sound. Traditionally advertising for educational institutions conveys functional benefits such as learning new skills, nurturing natural talent, and personal development. Most schools still use variations of these today. Tosando rises above these to the emotional benefit that musical ability can connect you with others in a way other forms of communication can’t. Interestingly then, one of the most famous examples of going beyond functional claims to an emotional one, as well as of the use of storytelling in advertising, is for a music school. 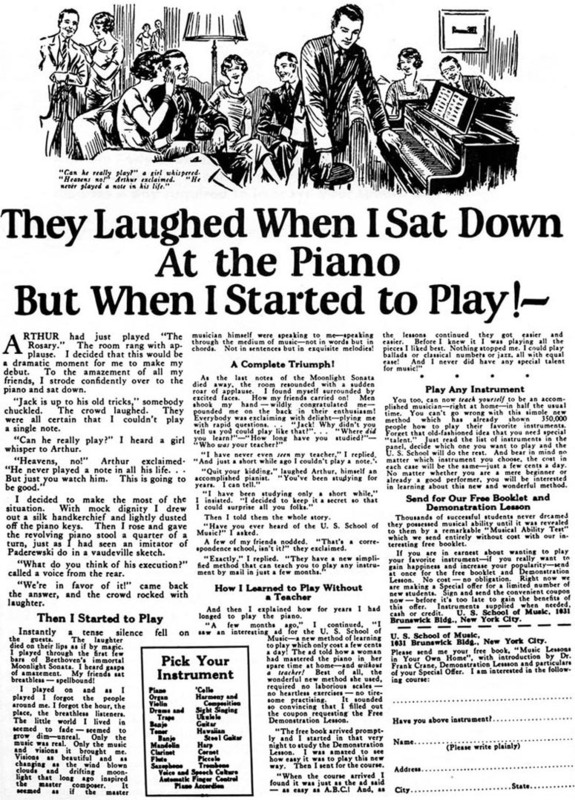 Most students of advertising would know John Caples’ iconic 1926 ad for the U.S. School of Music. While Caples appealed to his audience’s ‘shallower’ desires for admiration and popularity, his legacy is easily seen in the Tosando commercial. Maybe more brands should look for modern interpretations of classic ad structures. Ads that draw on fundamental human truths are inherently engaging. By incorporating circumstances or behaviours everyone can identify with, they touch us on a basic level. By illustrating the thought “Music transcends words” through a conflicted father- daughter relationship, the Tosando spot evokes everyone’s experience of parent-child relationships with all their emotional depth, imperfections, complexities and nuances. This vintage television commercial by Kodak exemplifies the power of tapping into a human truth and, again, the heritage Tosando is drawing upon. Though the music is superbly appropriate, the spot is visually simple. Its emotional impact comes from authentically reflecting the hopes and uncertainty of parenthood. Too often we see online ads that entertain but don’t brand. Where the focus on engagement, and on trying to get the spot to go viral, means that the viewer remembers the ad but not the brand that it’s supposed to support. Though highly emotive, the Tosando spot doesn’t have this shortcoming. Instead the brand is made integral to the story. In fact, without Tosando’s piano lessons there would be no story. You can’t recall the ad without recalling the brand. It is a point more advertisers should pay attention to.